When it’s hot and we’ve been working in the garden or barn, the most thirst-quenching drink we can imagine is something cold, sweet, and fizzy. A soda. Occasionally we find organic, all-natural sodas at the Amish bent and dent store and enjoy them as a treat, but in general we find them to be too sweet. Recently we’ve gotten in the routine of creating something even better: homemade sodas infused with herbs and flowers. 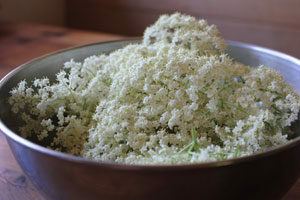 They are among the most delicious beverages I’ve ever tasted, so today I’m going to share how to make your own homemade soda from herbs and edible flowers you might already have in your garden. Either way, it’s the action of the yeast that carbonates the soda: as they eat a small amount of the sugar, they make carbon dioxide gas, which is trapped in the bottle, builds up pressure, and forms the carbonation. Making soda is not an exact science. You’ll want to get the proportions and timing pretty close to the recipe below, but don’t worry if you wiggle on quantities or ingredients. The point is to have fun and be creative! 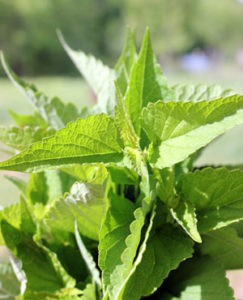 We harvested sage, anise hyssop and elderflowers from our garden and used these as flavorings, but you could also use strawberries, calendula, chamomile, rhubarb, lavender, lemon juice, and so on! 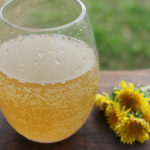 You might also want to try my Dandelion Soda recipe. 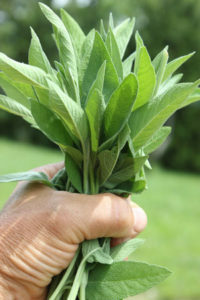 1) Place your large handful of herbs in one gallon of water. Bring to a boil, and then allow to cool slightly before adding sugar. Stir to dissolve the sugar completely. 2) When the liquid has cooled to room temperature, stir the lemon juice, and either your ginger bug starter or the yeast into the “tea.” Mix well. 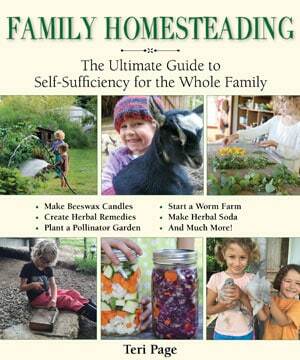 3) Using a funnel for spill-proof pouring, and a strainer to catch plant material, pour the soda into bottles. You can use flip top bottles designed for brewing, like these ones, or you can use food grade plastic soda bottles. 4) Set the bottles in a room temperature location for around 48 hours (36 in warmer summer weather) to develop carbonation. IMPORTANT SAFETY NOTE: This is when you need to be most attentive to your soda. If you leave it in a warm environment for too long, the CO2 gas pressure can become so great that the bottles can explode, with potentially injurious results. Even though these glass bottles are designed for brewing, you will want to pay close attention to your ferments. 5) If you want to check for fizz, you can slightly crack open one of the bottles to see how fizzy it is, then recap it quickly. 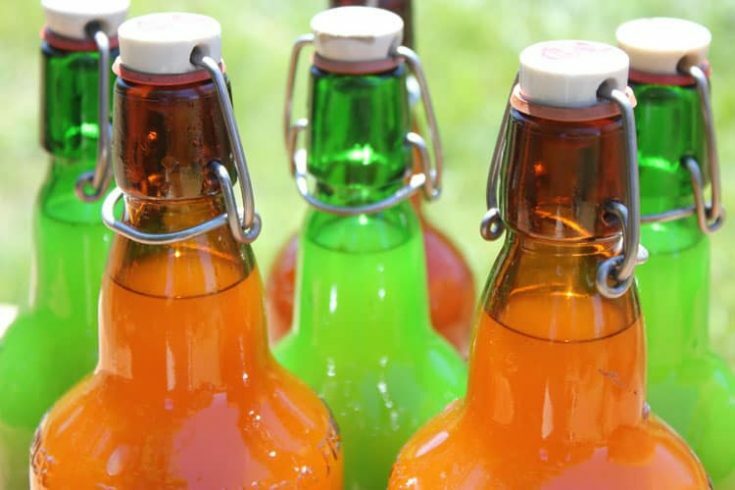 After carbonation, move the bottles to your refrigerator, or another cold location. Although the cold slows the activity of the yeast, it doesn’t stop it altogether, so plan on drinking it within the week. 6) Open carefully, cracking the seal slowly to monitor how much carbonation has occurred. Sometimes, it may foam out a bit like champagne, so hold the bottle over a bowl to capture any spill. Serve cold, or over ice, and enjoy! 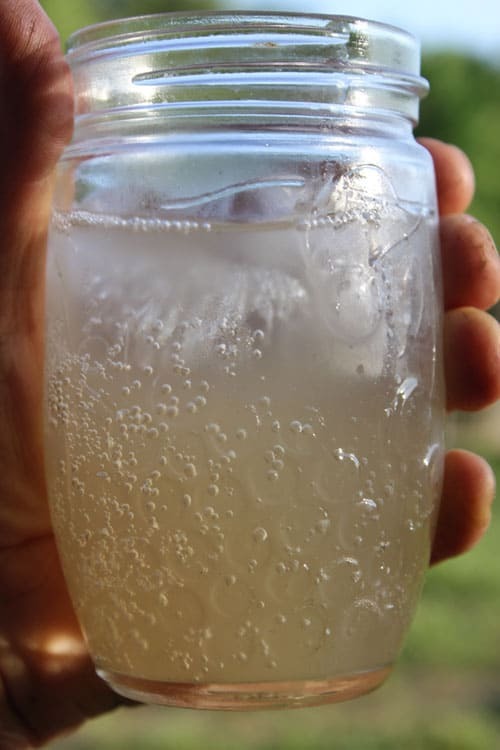 Light, sweet, fizzy, and refreshing, homemade soda is the perfect ending to a hot summer day. 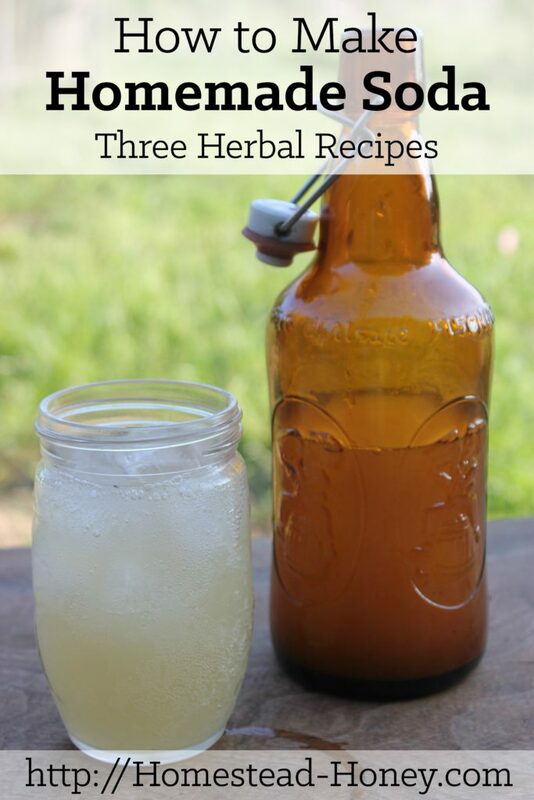 This post will teach you how to make homemade soda at home. 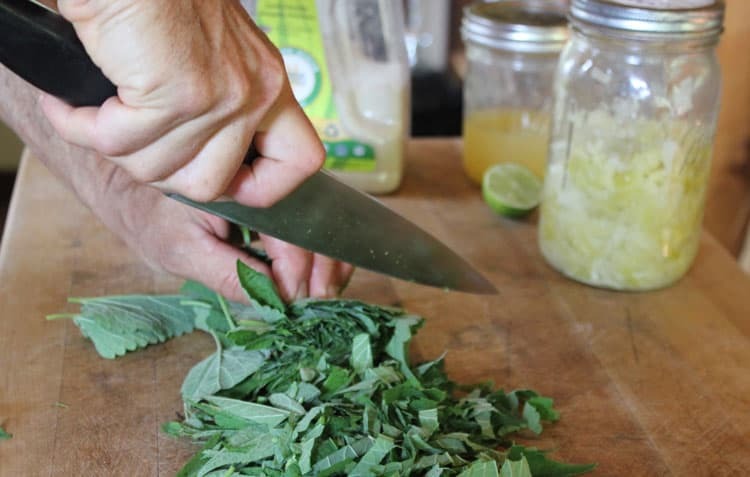 Place your large handful of herbs in one gallon of water. Bring to a boil, and then allow to cool slightly before adding sugar. Stir to dissolve the sugar completely. When the liquid has cooled to room temperature, stir the lemon juice, and either your ginger bug starter or the yeast into the “tea.” Mix well. 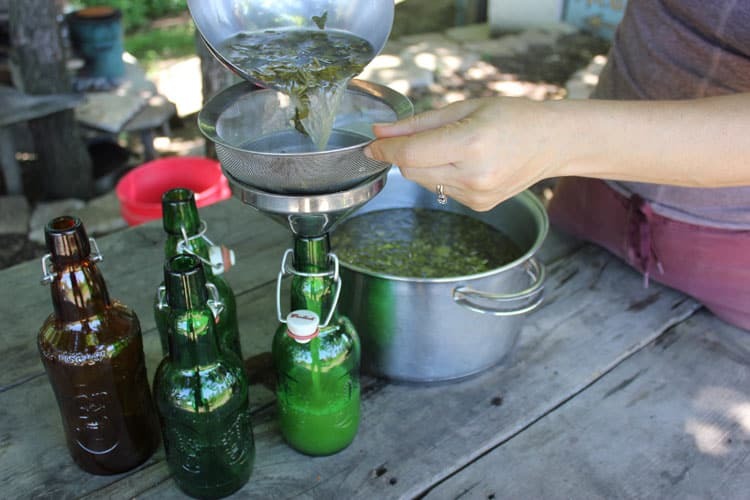 Using a funnel for spill-proof pouring, and a strainer to catch plant material, pour the soda into bottles. You can use flip top bottles designed for brewing, like these ones, or you can use food grade plastic soda bottles. If you want to check for fizz, you can slightly crack open one of the bottles to see how fizzy it is, then recap it quickly. After carbonation, move the bottles to your refrigerator, or another cold location. Although the cold slows the activity of the yeast, it doesn’t stop it altogether, so plan on drinking it within the week. 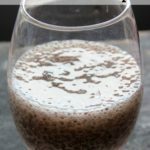 Do you think water or milk kefir could be used instead of whey or sauerkraut juice? 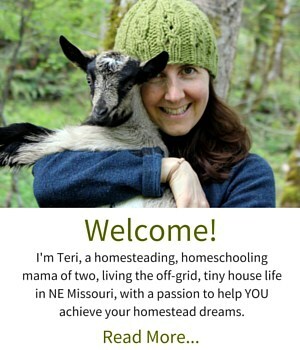 I bet you could use a little strained water kefir. I don’t think I’d use milk kefir, as it could mix with the lemon and curdle. So excited to try this recipe! Thank you for sharing. What champagne yeast do you like to use? I see several brands on Amazon. 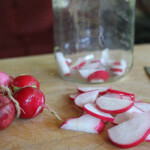 As a side note, do you have a source for the lovely glass jar you are using to enjoy your soda? As for the bottles, they are from Grolsch and Fisher (Fischer??) beer. We just bought a bunch of the beer, for the bottles, mostly, and have had them for years. They are precious and wonderful! I can’t make out the brand on the graceful jar that you are drinking from…I’ve never seen that shape!! One is Grolsch, one is Fisher (or Fischer?). We found a lot of these at thrift stores, just collecting them over the years! Thanks for this! 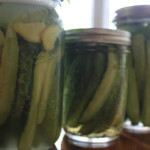 (received from your newsletter) I am always looking for new wayy to use fresh items from our gardens, and love the idea of sodas. I will defintely be trying it. They have been SO enjoyable! What’s the alcohol content like on this? Mine tastes pretty alcoholic….I let it go for maybe a day longer than the 48 hours but that couldn’t have done too much, right? It will become more alcoholic the longer it ferments. But I’m not sure of the exact content. 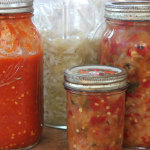 Try a shorter ferment next time and see how you like it!